Part of the strategy of entrepreneurs Ken Smith|! !| left|! !| and Gary O'Neil|! !| right|! !| is to team up with UNH Manchester in creating what they call ‘an early-stage through completion|! !| startup internship program’ in developing and marketing Rejjee. They’re shown here with Barbara Wirth|! !| UNH internship coordinator|! !| and Paul Bencal|! !| director of the Emerging Technology Center at UNH Manchester. New Hampshire marketing and advertising maven Gary O’Neil doesn’t mind marching to the beat of a different drum. For instance, he likes databases. He sees them as a potential goldmine of information, such as the Department of Justice’s Uniform Crime Data annual reports. In fact, the fast-growing mobile app startup Rejjee, which O’Neil co-founded with serial entrepreneur Ken Smith of the MIT Enterprise Forum, had roots in a crime statistics database excursion. O’Neil said he was intrigued by the possibility of creating a real-time application to get ahead of the crime cycle – or have an immediate portal to report personal property crimes. “It’s one thing to know what happened regarding crime six months ago, but to know it in almost-real-time would be extraordinary – a really disruptive event,” said O’Neil, former president and CEO of O’Neil Griffin Bodi, one of the top ad agencies in northern New England for more than three decades. In less than a year, O’Neil’s kernel of an idea has matured quickly. With O’Neil playing the role of “Mr. Marketing” and Smith taking on the “Mr. Technology” part, O’Neil says Rejjee has created first-of-their-kind mobile apps with the potential to revolutionize how consumers, police, insurance companies and retailers handle lost or stolen property. Developed first in Cambridge, Mass., the company has located its strategic and product development operations in New Hampshire. Earlier this year, Rejjee announced a partnership with the University of New Hampshire at Manchester to enlist 12 interns to assist with strategic product review, data analysis and research and development. “Rejjee will take its place in the education development pipeline by providing extended learning opportunities like this,” said O’Neil. Smith and O’Neil have hit the police trade show circuit, and so far have signed up more than 100 different police departments in 15 states, including Kensington in New Hampshire. The developers believe the number of participating jurisdictions will grow quite quickly, as their marketing approach has been one-to-one product demonstrations with law enforcement agencies at multiple trade shows. 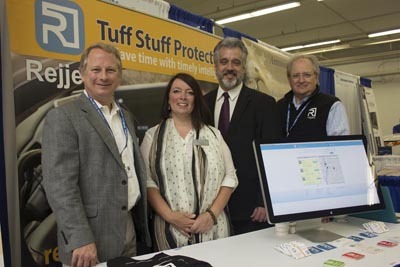 O’Neil said the mobile apps – Mobile Blue, used to report property theft to local police departments, and Tuff Stuff Protection (TSP), to obtain replacement items at discount prices from participating retailers – have the potential to make a major dent in the costly cycle of personal property theft. Based on law enforcement statistics, O’Neil estimates property crimes have a direct economic impact of $50 billion each year on consumers, with insurance companies facing $90 billion in fraudulent insurance claims each year. “When you consider that the FBI says that annual losses from this type of crime impact as many as 23 million people, you quickly understand how overwhelming the reporting process could be between police, insurance companies and crime victims,” he explained. Rejjee doesn’t replace the many “find it” apps designed to find missing or stolen goods, but O’Neil said that, according to FBI statistics, those apps only work about 7 percent of the time. In theory, Rejjee’s TSP app can work for the 93 percent of people whose goods are not recovered. By signing up on Rejjee, these consumers can automatically link with partner retailers who will provide hefty discounts for replacement items. O’Neil explained the permission-only platform for Rejjee can attract a wide generational shift. O’Neil said the company has attracted the interest of venture capital investors and plans to make money through premium subscriptions and licensing agreements with retailers and insurance companies. As for the name: Rejjee is shorthand for “registration,” and when O’Neil and Smith first tried to trademark and create a URL with the name spelled with “gg” instead of “jj,” they ran into a previous owner – Baseball Hall of Famer Reggie Jackson.